We’ve geared up our motor legal protection to put the brakes on insurance rates, and we’re giving young drivers the right of way. It’s certainly not news to anyone that young motorists receive a lot of bad press when it comes to accidents on the road. Recent findings by the RAC Foundation showed that one in five will have an accident within six months of passing their test. Regardless of who is at fault, these figures emphasise that it is now more important than ever for drivers aged 24 and under to seriously consider safeguarding themselves with the cover provided by motor legal protection. Motor legal protection is designed to help you recover your losses in the event of a motor-related accident that wasn’t your fault. The policy will pay fees up to £100,000 to help you recover any uninsured losses (such as claims for personal injury, vehicle repair costs, car hire charges, loss of earning and any policy excess). An increasing trend amongst young people is to opt for the most basic level of car insurance, third-party cover, to reduce the soaring premiums they’re faced with. 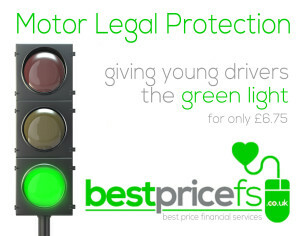 Motor legal protection provides a savvy way of increasing your level of cover on top of this, all without breaking the bank. At only £9.99 a year, Best Price FS offer you this security as well as unlimited vehicle hire for a non-fault accident. We know that an accident can cause a lot of stress, so we’ve designed our cover to keep you, our customer, on the go. What’s more, this vehicle hire is available to all, regardless of age, and will provide you with at least a like-for-like car in non-fault cases. A One Poll survey conducted in 2013 highlighted the lack of confidence many young motorists feel after passing their test. 29% reported feeling completely unprepared to drive alone after passing their test, and considering the statistics stacked against them, it’s no surprise many feel this way. Our motor legal protection can help relieve some of this anxiety and leave you knowing that, should you be involved in an accident that was not your fault, you’ve got the best cover around. Many customers don’t actually understand the benefits of having motor legal protection, seeing it more as a costly add-on pushed by their insurance providers. Often, this can be true: some companies will charge you as much as £30 for this service. Buying it as a stand-alone product instead gives you a far greater opportunity to shop around, and you’ll find our cover ticks all the boxes. Not only is it the most affordable out there, you’ll also be getting an exceptional quality product, a feature that is all too often sacrificed when paying so little. No-one likes to spend unnecessarily, especially on the less exciting things like insurance products, and managing money when you’re young can sometimes seem like an impossible task. But hindsight is a wonderful thing, and I’m sure many of us have regretted not taking out insurance before it was too late. With the peace of mind provided by our cover, at least you’ll know that you won’t be stung by any unexpected fees. Departing with your initial couple of quid may seem like a bit of a drag, but compared to the amount you’d have to fork out without this cover, it’s a no-brainer. So switch on, sign up, and start saving with Best Price Financial Services today.